Since I just added a new “crop” of authors, one of whom has a sleuth who is a florist, I decided there wouldn’t be a better time to add this new theme to the Cozy Mystery site. Here are the authors who are already posted on the Cozy Mystery site who write series which have either a flower farm worker, a florist, or a flower shop owner as their sleuths. Beverly Allen (aka Barbara Early) writes the Bridal Bouquet Shop Mystery Series. This series takes place in Virginia and features Audrey Bloom as our sleuth. Audrey co-owns the Rose in Bloom flower shop. Kate Collins pens the Flower Shop Mystery Series. So, law school wasn’t for our sleuth, Abby Knight. Good thing Abby has decided to open Bloomers, a flower shop in Indiana. Abby is able to arrange the clues as well as she arranges her flowers. 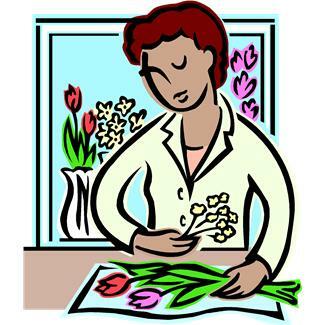 Joan Hadley (aka Joan Hess) writes the Theo Bloomer Mystery Series, which features a florist. Theo’s previous life included a stint as a CIA spy. Janis Harrison brings us her Bretta Solomon Gardening Mystery Series. Bretta is a widow who has a flower business in Missouri. As a new widow, she has taken up sleuthing. Vicki Lane pens the Elizabeth Goodweather Mystery Series. Elizabeth (a widow) own a farm in North Carolina’s Appalachians. The farm grows both flowers and herbs. Rebecca Tope writes the Lake District Mystery Series. This series takes place in the lake district region of England. Persimmon “Simmy” Brown owns a flower shop and sleuths between arranging her flowers into beautiful arrangements. In the same vein, here is my Gardening Cozy Mysteries entry. Thanks for this theme; I’ll be keeping my eye on it. “Rosemary & Thyme” was/is one of my favorite TV series, and I wish they had carried on with those characters in books even if the show had to end. I haven’t yet found any books that capture the spirit of that show for me, but I’ve been hoping to. Joshua, if you find any books that do capture the Rosemary & Thyme feeling, please let us know. Danna, Will do on R&T! I purchased Miss Buncle’s Book a few months back but have yet to read it. (My to-be-read pile is ridiculous and I am capricious in my reading choices.) I am glad to hear you liked it. I have heard it compared to Benson too, and liked the kindle sample I read. I will move it towards the top of my pile. 🙂 Thanks! Not too long ago I read a book by Beverley Nichols called “Green Grows the City” and I think it may be the closest to Benson-esque that I’ve found so far. It’s more of a memoir, as all Nichols books seem to be, but this is about his obsession with gardening [the gardening theme comes full circle!] and how he transformed his home garden over the course of some years. During the time he has an ongoing feud of a sort – of a very dignified but sly and catty tone – with a neighbor, who was a very haughty lady. I laughed out loud and smiled constantly reading it; it struck me as very Mapp and Lucia – esque. I’ve been recommending it to anyone I know who likes Benson. As you said, indeed no one is Benson! But I really did like that one a lot. Joshua, thank you so much for all the Benson information. I just read your comment about Beverley Nichols’ Green Grows the City, went to Amazon, and bought the Kindle copy. I didn’t even read the reviews >>> which is very out of the ordinary for me! I absolutely trust your opinion about all-things-Benson. I read a Kindle example of a Barbara Pym book right before I decided on Miss Buncle’s Book, since I was in the mood for an E.F. Benson, but wasn’t quite sure I wanted to re-read one of them. I didn’t end up buying the Pym book, but instead went with D.E. Stevenson’s book. While I enjoyed it, it’s not as “sly” as Benson. (I’m not sure “sly” is the correct word I’m looking for…) Benson did it so well, that he sort of ruins it for the others! I have made a note about Pym’s Crampton Hodnet and Jane and Prudence, neither of which is the one I tried on the Kindle sample. Oh my, I hope I don’t lead you astray, Danna! 🙂 Thanks for the great compliment of trusting my Bensonian opinion. I do hope you like Beverley Nichols (and I think you just might). Now that you’re on Facebook, I highly recommend checking out the Mapp and Lucia group there. It’s a really active group of Benson fans and we have some great discussions on there. Joshua, if I don’t like it, I’ll tell you privately! 🙂 I suspect so too, but do let me know either way. I’m not sure of the limitations within this category, but you might also consider including those cozy mystery series with a dominate emphasis on gardens and landscaping. I’ve read all the following series and there’s a focus on gardening/landscaping throughout the stories. MJ, your comment inspired me to add my Gardening Cozy Mysteries theme to the bottom of this list. Thanks! Great minds think alike, as the saying goes! Only this morning I realized that my little Sparrow Falls village needs a flower shop. It already has a barber shop, an antiques shop, a beauty shop (of course! ), a sandwich shop and a hardware store. I’ve been online searching for other cozy writers who have novels featuring florists, and visited your site first. I will be downloading ebooks this evening! Thanks for your timely post, Danna! Donna Mc, I love your Homes of Sparrow Falls page! Thank you! I’m glad you enjoy it. 🙂 Beverly Allen’s Bloom and Doom is now on my kindle, and so far, so good! The Victorian topic of “what flowers mean” is fascinating, but rarely mentioned in modern day books. That is what caught my eye, and I decided to start reading the floral shop/florist sleuth books with this one. Thank you for the info about D. E. Stevenson! I love her books and have been collecting them for years. Read some of her more “Scottish ” books and especially the ones about WWII and you would see a different tougher style. Maybe I will try a Pym book to see if I like it. Marla, be sure you read Joshua’s comment that he just posted. It might help you pick which Barbara Pym you want to read. I printed out a list of all of D.E. Stevenson’s books and wondered how she had the time to write so many. Since you know them, which ones do you think are the most similar to her Miss Buncle books? I’m going to make my way through those, and after looking at the long list, wondered where I would go next. How about The Final Arrangement by Annie Adams? It is supposedly the first in a series (The Flower Shop Mystery Series). It was a fun read, I am looking forward to the next one! SBeth, thanks for telling us about Annie Adams! I’m loving all the cozies about flowers/gardening. How about the new series by Lyndsey Cole? Begonia Means Beware, Queen of Poison and just out – Roses are Dead. Adriaan, thanks for telling us about Lyndsey Cole’s Lily Bloom Mystery Series. (Begonia Means Beware is book #1).